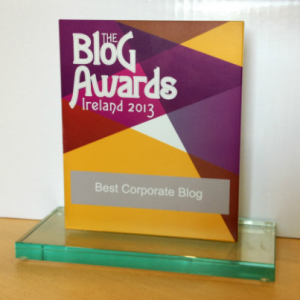 I’m delighted to say that last Saturday my employer, Chill Insurance took home a gong at the prestigious Blog Awards Ireland. We won Gold in the Best Corporate Blog category (the first award the company has won), so naturally I’m very happy. And while it’s nice to be recognised on the national stage, it’s even more pleasing to reflect on the changes which have taken place inside the business over the last year. That’s because when I first joined the company, we typically published a blog post once per week, but I’m delighted to say that we now have a team of 15 people from across the business writing for us – which enables us to post four times a week and sometimes even five. It’s been quite a journey and I’m proud to have helped foster a Culture of Content. As well as growing in frequency, the Chill Insurance blog has become pretty popular too. Blog traffic has grown by a whopping 154% in just 12 months and it’s also been quoted in the media. Subsequently we’ve seen great improvement in the number of new visits, bounce rate, search engine visibility and most importantly, lead generation. The formula of fresh content, on-page SEO and meta description has transformed the blog and helped us to diversify our sources of website traffic. PPC, SEO and display are effective methods to hit those all important success metrics. But with so many competitors investing in the same activity we’ve looked at new ways to generate traffic that converts into leads. That’s why over the past 12 months we have sought to use our blog (as well as social media, e-newsletter and online videos) to drive high value traffic to our product landing pages. How do you inspire people to write? Especially, when it’s not in their job description. We’ve managed to encourage people by creating some friendly competition between teams and rewarding the winners. We’ve also managed to develop a team of bloggers by regularly communicating the business benefits of each post, such as its reach, leads generated and sales. Although it can be difficult to continually craft fresh content, our strategic and data-driven approach keeps us focussed on reaching, engaging and converting web visits into leads. To create content that resonates we scour the news, study web analytics, understand what people are searching for and look for opportunities within search. Once this exercise is complete we draft a content calendar and then the task of helping our team of bloggers create content begins. Great content gives people a reason to return to our website and share interesting posts amongst their social networks – increasing its reach and our reputation in a very impactful way. But for content marketing to be successful and drive traffic, leads and most importantly, sales, it needs a strategy to underpin it, data to shape it and analytics to measure it. Without these crucial elements you’ll lose the battle for relevance.